Pretty Scrappy: It's my birthday! How 'bout a free kit and contest??? It's my birthday! How 'bout a free kit and contest??? So I decided to retire my "With a Cherry On Top" kit, but as I was about to take it out of the store I decided... Why not give it to you all? :) Click the pic below to snag it, but while you are there, make sure to check out my $1 sale! 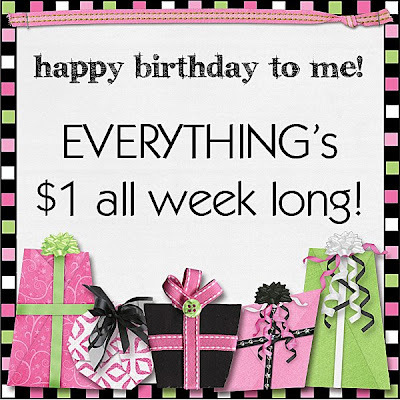 Everything in my store is $1 for my birthday for the rest of the week, woohoo!!!! I am also running a contest this week! Starting today, for every order for my products, between now and Monday will be entered into a drawing... One random winner will receive a $25 gift certificate toward a future purchase. PLUS The person that makes the biggest order will automatically win a $25 gift certificate toward a future purchase! I have made a few BIG changes in my schedule and will be releasing new items a lot more frequently including 4 new products scheduled for next week!!! I will be back Monday night to post the winners! Good luck! I am off to bed after this post and when I wake up it will be my birthday, yay!!! My Avon walk is in just over 3 weeks!!! I am so excited! I have a long way to go in my fund raising, so if you know anyone that would be interested in helping out, I have coordinated "Think Pink" charity collab kit benefiting breast cancer research to treat and prevent breast cancer! Check out this gorgeous and touching layout created with the kit. I really hate asking for things, but this cause means so much to me. Please help if you can. In your paypal notes if you leave me a name of a loved one, I will proudly wear their name on my shirt when I walk a marathon and a half on April 4-5. I am going to be walking in memory of my grandmother that passed away from breast cancer and I will gladly walk in honor of your loved ones as well. Please help if you can. I will be posting on or around April 3rd right here, my paypal receipt showing proof that 100% of the sales of this kit are being donated to the cause. Thanks in advance. Millions of women all over the world will thank you! Here is your free kit, grab it while it lasts... it's coming down after the sale is over and will be gone for good. Thank you so much for this Freebie. I want to let you know that I posted a link to your blog in Creative Busy Hands Scrapbook Freebies Search List, under the Kit(s) post on Mar. 10, 2009. Thanks again. $1 dollar deals... LAST DAY!!! "Love" Days of the Week mini kit FREEBIE!! !